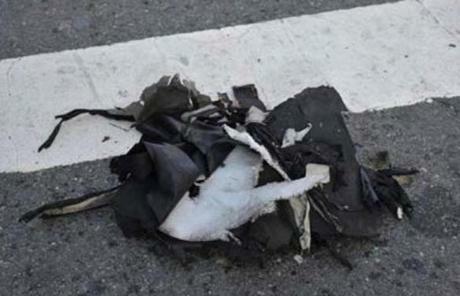 Remains of a backpack the FBI says contained one bomb. 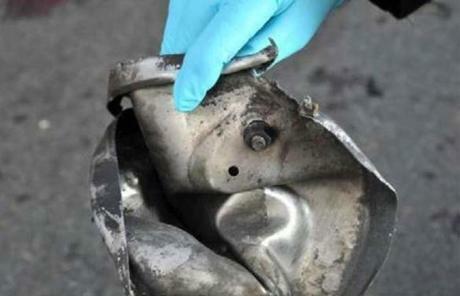 This image shows the remains of a pressure cooker that the FBI says was part of one of the bombs. 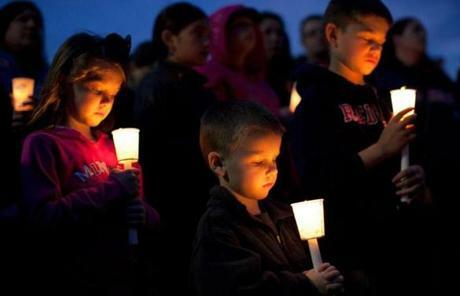 Emily Gillis, 7, her brother Conor, 4, of Dorchester, and their cousin Benjamin McCormick, 8, of Milton attended a vigil for blast victim Martin Richard at Garvey Park in Dorchester. 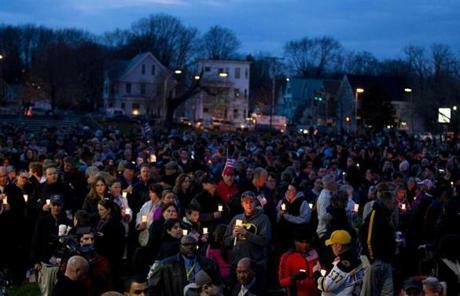 Garvey Park in Dorchester was nearly filled with people during the vigil for Martin Richard, who was killed in Monday’s blasts. 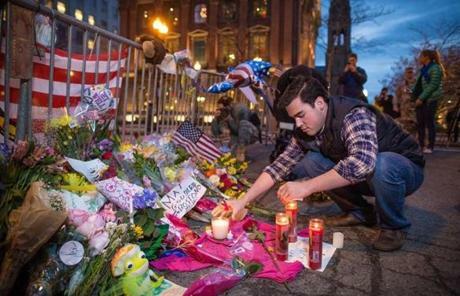 Sam Galvin of West Roxbury added candles to a makeshift memorial on the barricades blocking off Boylston Street. 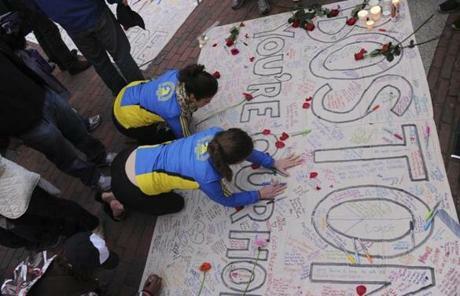 Sisters Justine Lescarbeau (left) and Jocelyn Lescarbeau, both of Boston, sign a banner during a vigil and memorial on Boston Common. 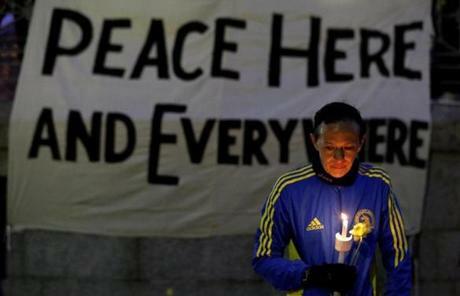 Lizzie Lee, 56, of Lynwood, Wash., who had participated in her first Boston Marathon, holds a candle and a flower at a vigil at Boston Common. 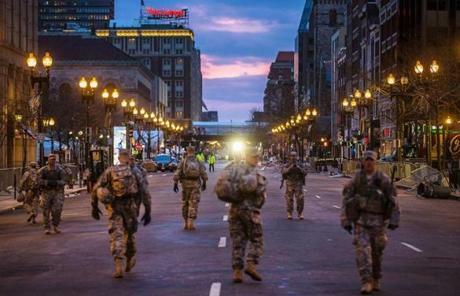 Members of the military walked along Boylston Street near the finish line of the Boston Marathon. 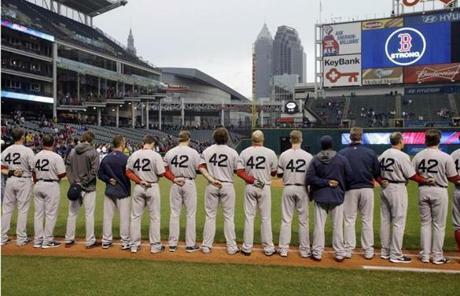 The Red Sox had a moment of silence for victims before a game in Cleveland, playing the Indians at Progressive Field. 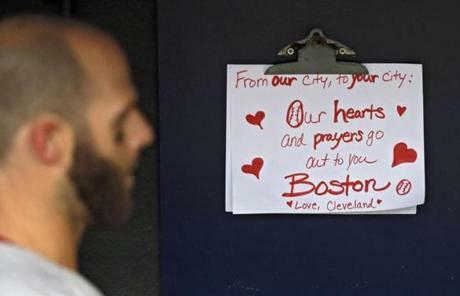 Sox second baseman Dustin Pedroia walked past a sign from an Indians fan in the dugout. 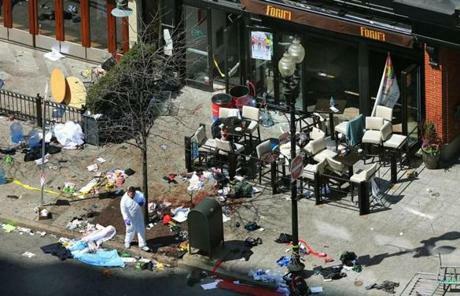 Investigators were combing through the aftermath of the deadly Boston Marathon terrorist attack Tuesday. 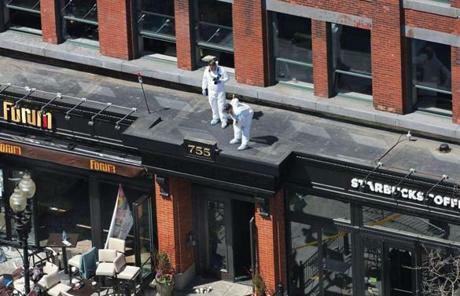 Two people stood above 755 Boylston St.
A wide view of the scene Tuesday. 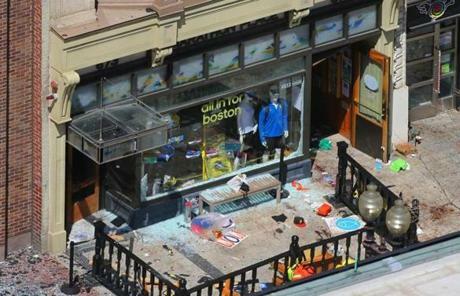 The scene outside of Marathon Sports, the site of the first bomb explosion. 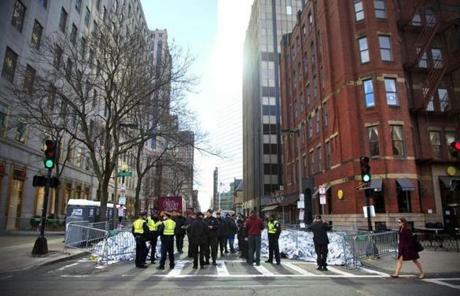 Police tape blocked off access to the area. 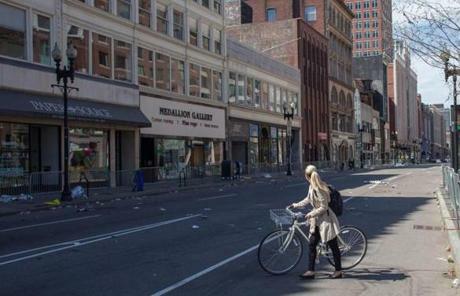 A woman looked down Boylston Street Tuesday, toward the finish line of the Boston Marathon and the site of deadly bombings a day earlier. 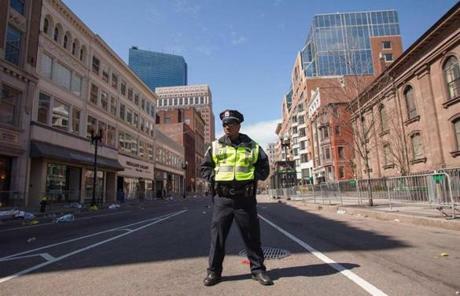 A Boston Police officer stood on Boylston Street on Tuesday. 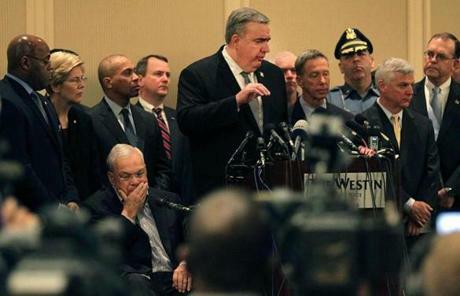 Boston Police Commissioner Edward Davis spoke along with other local and federal officials Tuesday morning. 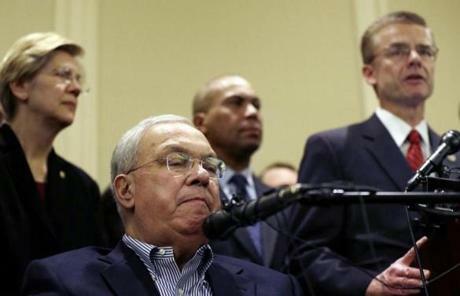 Senator Elizabeth Warren, Boston Mayor Thomas M. Menino, Governor Deval Patrick, and FBI special agent in charge Richard DesLauriers spoke at the press conference. 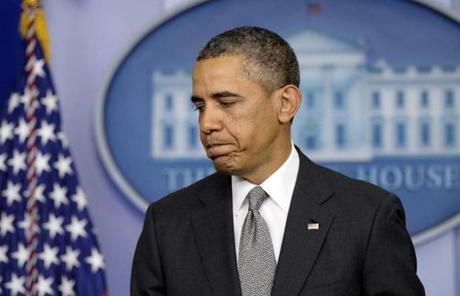 Speaking Tuesday afternoon at the White House, President Obama said, "We do not know whether this is an act of an organization, or an individual, or individuals." 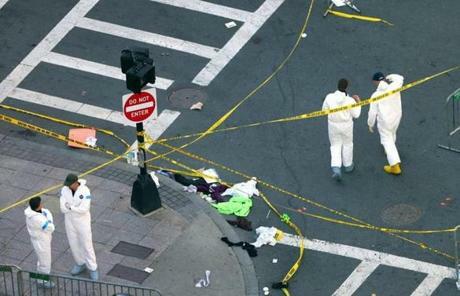 Roads around Boylston Street in Boston's Back Bay were closed and considered an active crime scene on Tuesday morning. 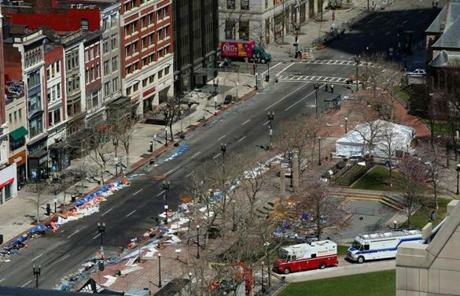 Another look at the scene around Boylston Street on Tuesday. 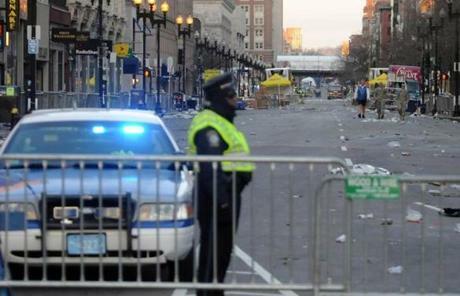 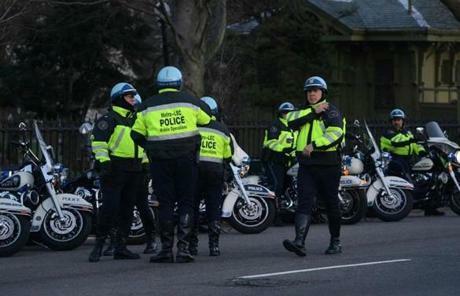 Boston Police officers stood near the finish line of the Boston Marathon on Tuesday morning. 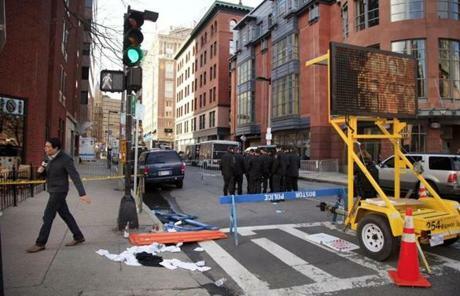 A police officer stood guard at the corner of Boylston Street and Arlington Street early Tuesday. 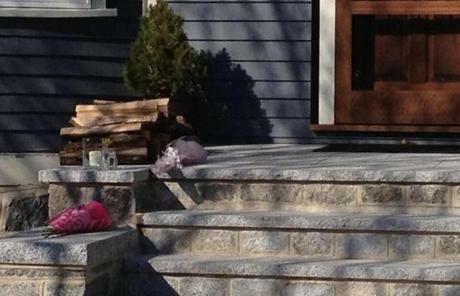 Neighbors left flowers outside the Dorchester home of the eight-year-old killed during the attack. 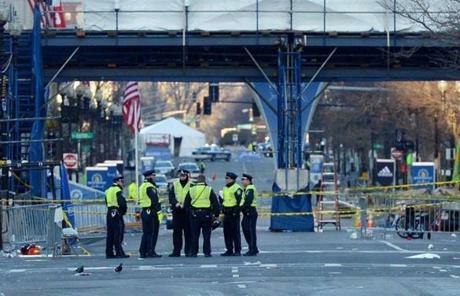 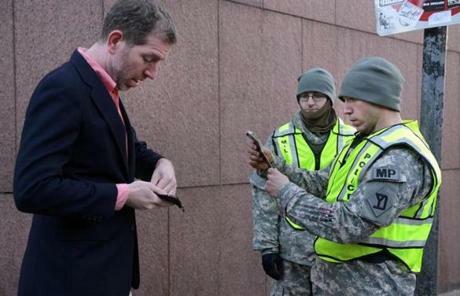 A military police officer checked the identification of a man on Massachusetts Avenue on Tuesday morning. 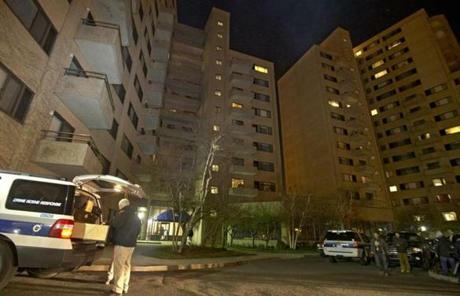 Overnight, a wave of law enforcement officials swarmed a home of a "person of interest" on Ocean Avenue in Revere. 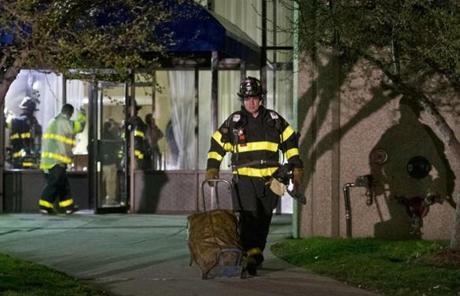 FBI and Homeland Security agents were seen entering the Water’s Edge apartment complex at 364 Ocean Ave.
Police units assembled along the Boston Public Garden on Tuesday morning. 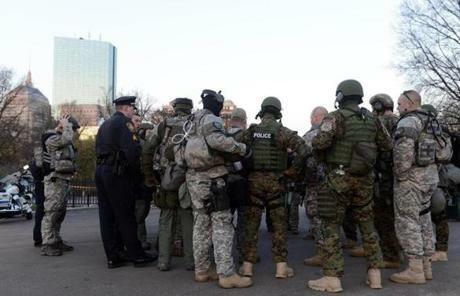 Special police units assembled in the Boston Common on Tuesday morning.